I am a doubting Thomas when it comes to trying new recipes. Not that I doubt the recipe. I doubt my skills at following recipes. Sometimes though, there are recipes that I just have to try to make because they look so delicious. I love pouring custard rather than cream on chocolate cake so when I saw this recipe I knew this was something I'd like. Not only did it have chocolate cake and custard, it also had caramel. Just by the looks of it, I could tell how delicious it was. This cake is also known as Chocoflan. Basically it is a chocolate cake with a cream cheese flan on top of it. Sounds simple and it actually is simple and easy to make. It is the way it is baked that earned it its name. 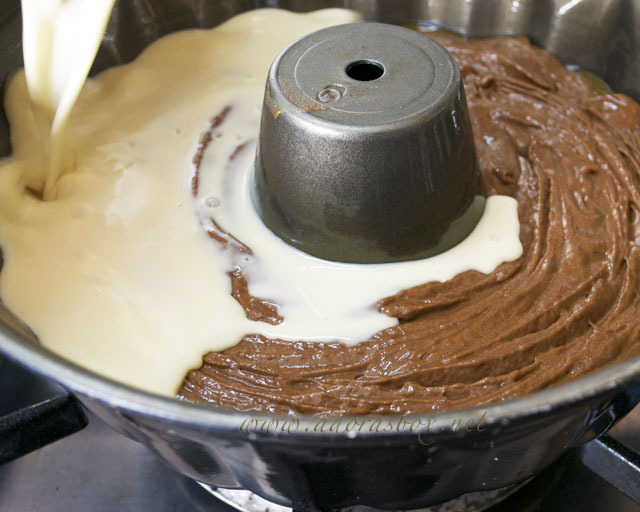 The chocolate cake batter gets poured in a caramel lined pan before the custard mixture is poured on top of it. Once baked, the two mixtures would have switched places. The custard settles to the bottom of the pan and the cake floats to the top. When inverted, the caramel glazed custard would be the crowning glory. I was expecting a much richer tasting cake but was pleasantly surprised that it has a very gentle comforting flavour and texture that you could just go on eating more and more. 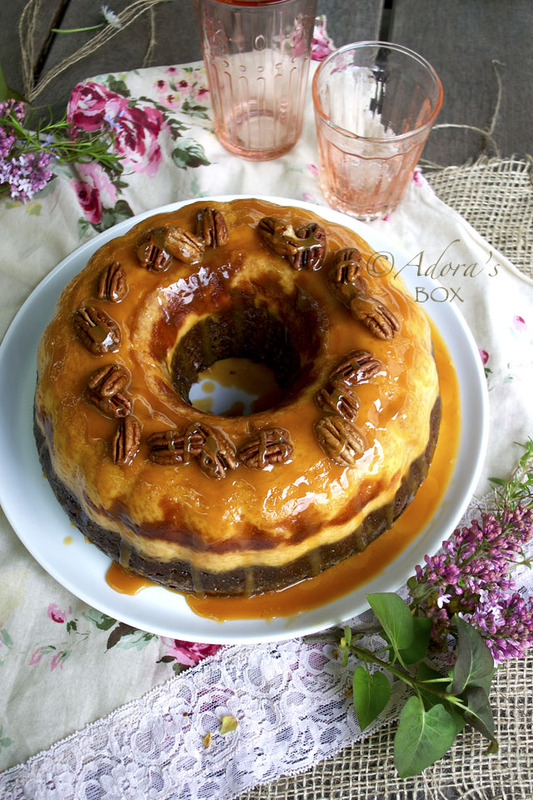 It wasn't super sweet so serving it with more caramel sauce gave it a more complete taste. I will probably add a bit more cocoa powder next time as my son said it could probably use more. I chose to follow Marcella Valladolid's recipe because I know that she would be an expert on these sort of things. The recipe is straightforward and all you have to do is to believe that it will work because it actually will. There were a few things I had to change. The size specifications of the condensed milk and evaporated milk tins were a bit different from the ones we have here in the UK. I used a 410 gm. tin of evaporated milk and a 397 gm. tin of condensed milk. Although a 12-cup bundt tin was specified, I used a 10-cup one because that was all I had. I also used half Greek yoghurt and half milk in place of the buttermilk. The recipe worked like a dream and I was nervous about taking it out of the mold but it came out easily and in one beautiful piece. 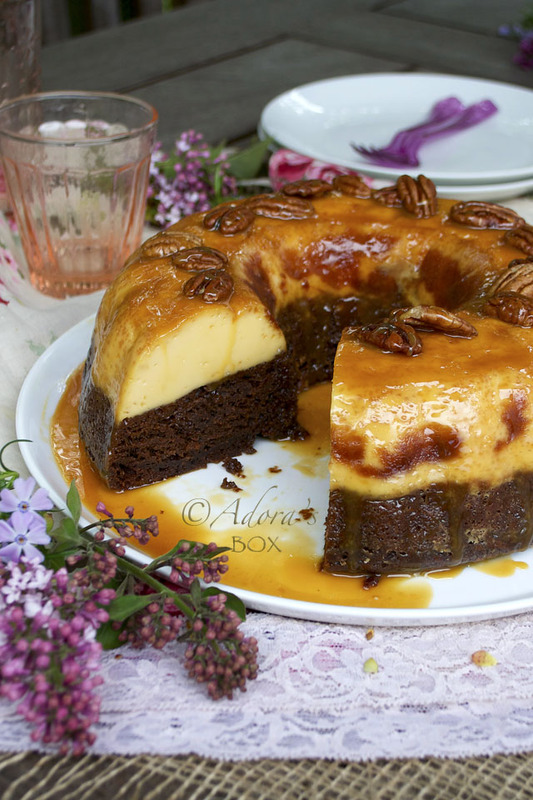 The cake was dense but not heavy and the flan is soft, rich but not cloying. I was fascinated by how the liquid white flan mixture seeped past the thick chocolate cake batter and still came out untainted. Celebrate World Baking Day on Sunday (May 19). 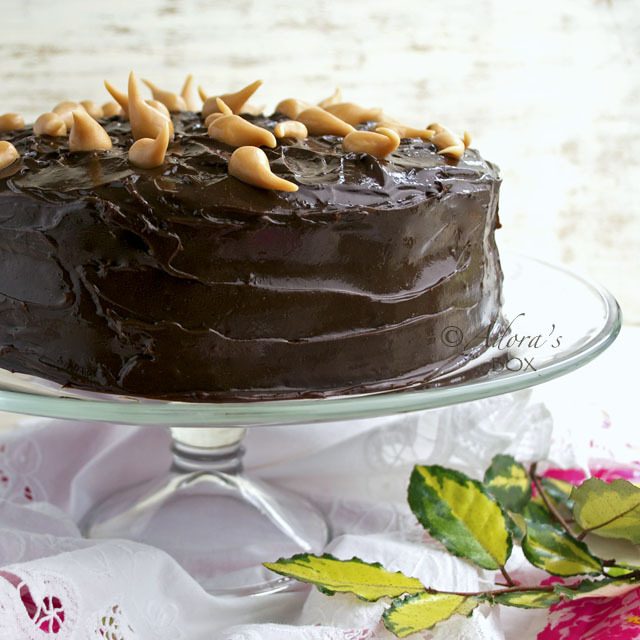 If you want to impress your friends and family, make this cake, make the impossible possible. Amaze them. 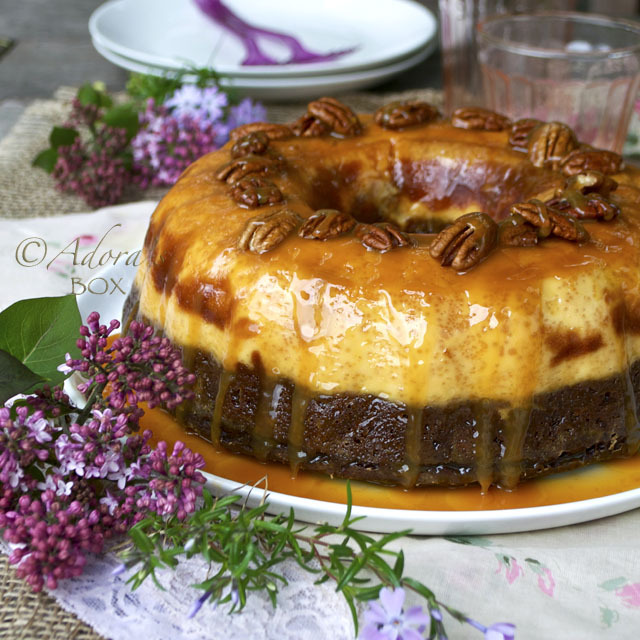 Adapted from Marcella Valladolid's recipe of Chocoflan. Grease a 12-cup bundt pan (I used a 10-cup one) with butter or baking spray. Pour 1/4 c. of caramel at the bottom of the pan. 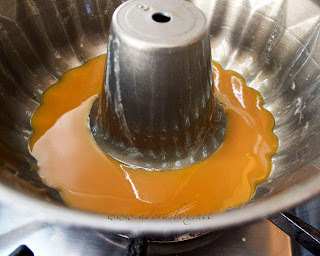 If the caramel is too thick, warm it up just so it will settle evenly on the bottom of the pan. Cream the butter and sugar together. Add the egg and beat until light and fluffy. Sift the flour, baking powder, baking soda, cocoa powder and salt in a separate mixing bowl. Beat 1/3 of the flour mixture and half of the buttermilk into the egg mixture. Repeat, ending with the last of the flour mixture. Blend well. Spoon the cake batter into the pan. 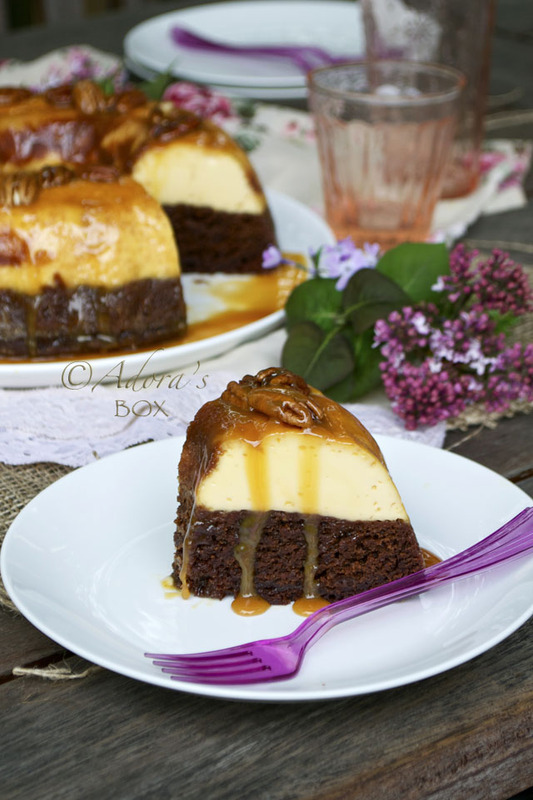 Carefully drag a fork on the top to even it out without disturbing the caramel at the bottom. Slowly pour the flan mixture into the cake batter. 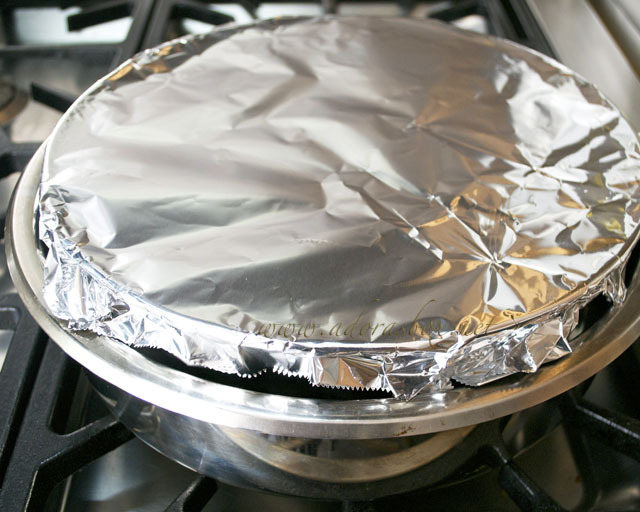 Cover with baking paper (so the top won't stick to the foil when cooked), then with foil. 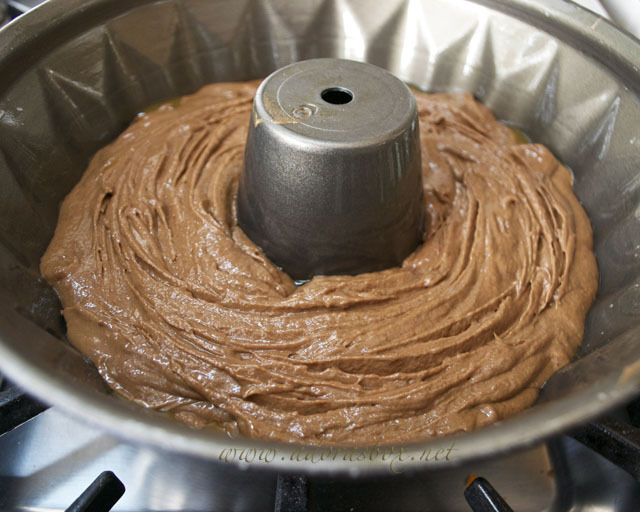 Sit the bundt pan on a roasting tin and add about an inch of hot water. Bake for about an hour or until a cake tester comes out clean. The cake layer should rise to the top. If there are still wet patches of custard remaining on top, cook further. Remove from the water bath and cool to room temperature. Gently run a rubber spatula around the edge and the center of the pan. Put an inverted rimmed plate on top of the pan, jiggle and flip over. Remove the pan and scrape any remaining caramel onto the cake. Arrange pecans on top and drizzle with more caramel. Slice and serve with caramel sauce. Mix all of the ingredients together and blend in a blender or with a hand blender. Oh wow, these looks really gorgeous and Im sure it taste heavenly delicious too. I love the pecan and the caramel sauce with it. Hi Adora, this is a very impressive looking cake. Anything caramel would be something I would love. Wow Adora! It is IMPOSSIBLE not to love this cake! We have had this before and its amazing!!!! 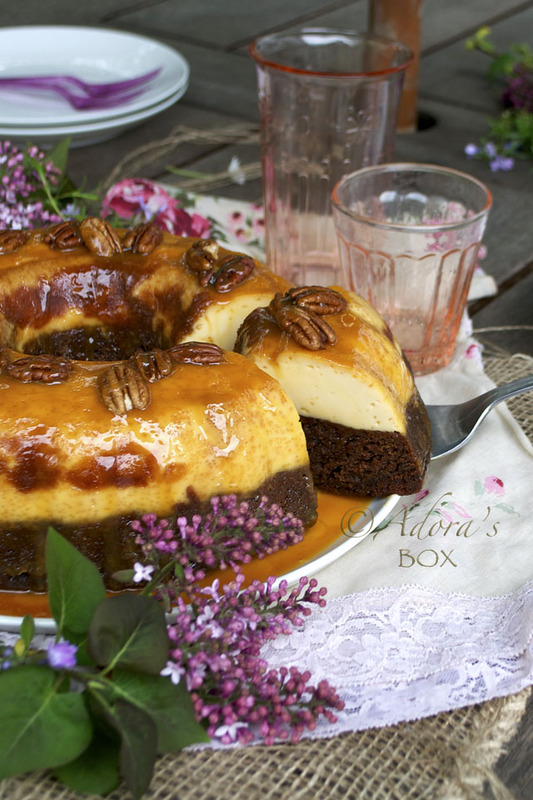 Who ever decided to marry a flan and a cake had a burst of GENIUS! I'm a little confused. 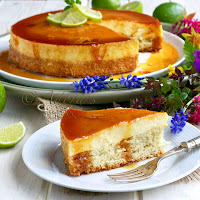 Shouldn't the flan mixture be put in the pan before the cake mixture since you want the caramel to be on top of the flan!?!? I'm I missing something because I definitely want to make this. Aishah, the caramel goes in first, then the cake batter and the flan mixture goes in last. I know it is confusing but that is why it is called impossible cake. The flan sinks to the bottom and the cake rises to the top of the pan when baked. The photos in the instructions might help. Try the recipe to see the magic. I'm totally speechless! What a gorgeous cake and I can't imagine it to be anything less that absolutely scrumptious! Your cake is so amazing, I just couldn't stop looking at it. Great work! Lovely! 3 whole eggs for the flan part? 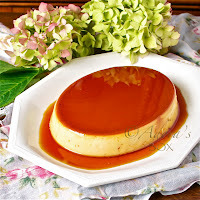 I usually make leche flan with the yolks only. Would that matter? Thank you. Hi Jeni. I use egg yolks for leche flan as well but since this cake has some "magic" in the process, I followed Marcella's recipe. I don't know if a change in consistency would still have the same result. Do you absolutely have to add the water bath to the bottom of the cake? Yes, the water bath is there to gently cook the custard, to achieve a velvety texture. I did this yesterday for my Tea Room. I looked at a ton of recipes for this cake and liked yours the best. I am happy and excited to report it was perfect and everyone loves it. Not to mention beautiful. Thank you so much. Wow this looks soooooooo good! There is one being sold commercially here in Pampanga - at Susie's Cuisine - but it looks quite dry (no caramel sauce) as compared to yours - will surely try this soon! I made this cake and all my friends were impressed. So was I! I was nervous at how the cake will come out but, just as you promised, it came out beautifully. Thank you for this recipe, Adora! I wish I can send you a picture of my lovely cake.